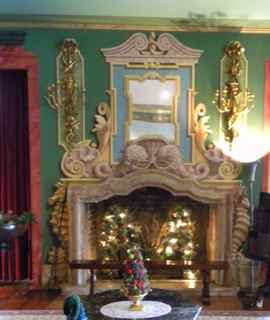 Located near my home in the Pocono Mountains of Pennsylvania, Grey Towers National Historic Site is a wonderful mansion to visit at any time of the year, but today it is abloom with beautiful holiday decorations. 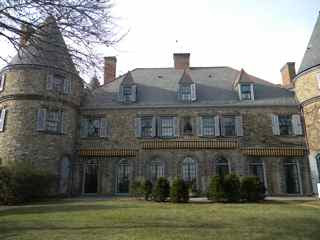 The mansion was the home of Gifford Pinchot and his wife Cornelia. Gifford was the first Chief of the US Forest Service and two-terms PA governor. 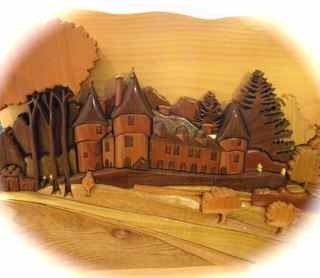 His father built Grey Towers, designed by Richard Morris Hunt, in the style of a medieval French chateau to reflect the French heritage of the family. The mansion was originally intended as a summer home and was completed in 1886. It is named for the towers on three corners of the L-shaped mansion. As a gardener, I am very drawn to Gifford Pinchot, not only because of his magnificent 102 forested acres at Grey Towers, but because Gifford implemented the groundbreaking concept of conservation, or sustainable use of our national resources. Therefore, I was very honored to be asked to speak at this year's annual Gifford Pinchot Audubon Society's holiday tea held at the mansion. The society requested a program on 'sustainable gardening practices that attract pollinators in light of the bee decline' ... a subject very dear to my heart. I loved presenting this program in such a beautiful, and appropriate, setting. Now, I have a confession to make. Although this wondrous place is little more than one hour from my home, this was my first visit! Oh, dear, why is it that we travel so very far to see the wonders of the world and miss those on our very doorstep? Now I cannot wait to return in the spring and summer to see the gardens in bloom. However, this first visit was very special as I toured the magnificent rooms, enjoyed the holiday decorations, ate delicious cookies and drank hot chocolate, and made new like-minded (as in gardening) friends! 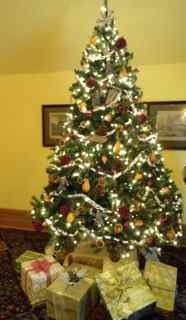 This is my favorite Christmas tree in the mansion. 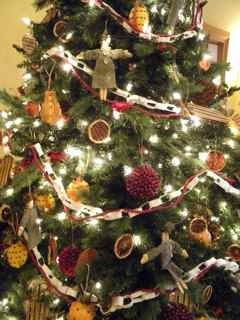 It was decorated with home-made, beautifully crafted ornaments. There are 15 fireplaces at Grey Towers. 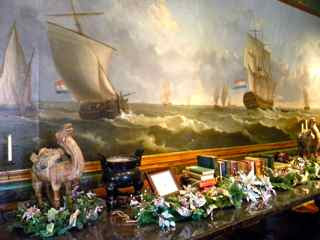 The most magnificent one is in the drawing room. 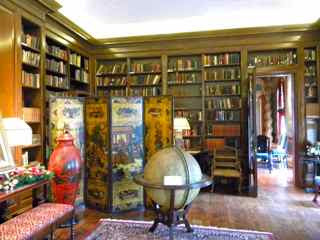 I think many of you who know me will understand why the library is my favorite room at Grey Towers. 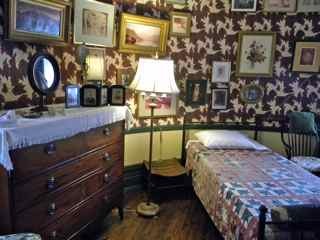 Like all the other rooms, it was very tastefully decorated. 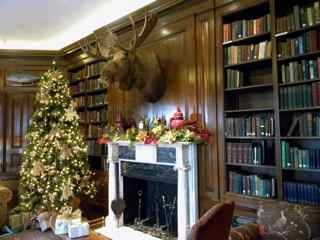 One thing I like about the holiday decorations at Grey Towers is that they are not 'over the top'. Gifford would rough it when he camped in the forest. Apparently, he also roughed it in his own bedroom as you can see from its austerity. 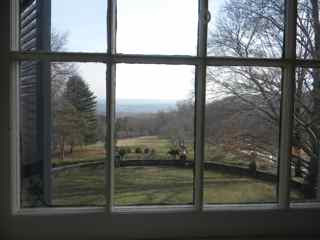 Many of the windows in the mansion afford wonderful views of the grounds. Outside, the stone walls surrounding the terraces are graced with elegant stone urns. 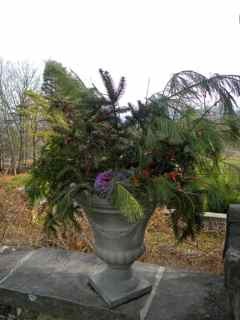 Today, the urns are filled with evergreens. I feel I want to cut down branches on my return home and start decorating my house and garden (no it isn't done yet) in a similar fashion. A casual mix of winter evergreens. I was surprised there is no dining room in the mansion, until I discovered why. The Pinchot family used the house for a summer home, so they usually ate outdoors. Cornelia designed a fascinating dining room in a courtyard. Chairs are arranged around a pool, under a stone arch and pergola. Guests use wooden dishes to float the food across the pool to each other. I can't wait to return in warm weather to witness this phenomenon! Incidentally, there is a magnificent wisteria covering the 'dining room'. I learned that a great deal of work goes into keeping it under control, but I would hazard a guess that the effort is worth it. The Finger Bowl: Outdoor Dining Room. 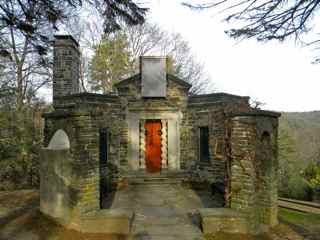 One of the buildings in the grounds is a cute stone playhouse. The materials used to construct the mansion and out building were mostly from the local area. The Tinderbox. A playhouse built for Gifford and Cornelius' s son. 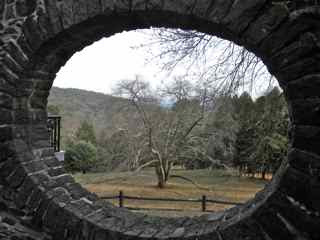 The little courtyard in front of the playhouse has elliptical windows affording wonderful views. The one below frames Grey Towers' most popular tree, the European copper beech. Gifford planted nine of them in the 1920's. I am so happy I visited Grey Towers at last. I am grateful to Lori McKean of the USDA Forest Service for coordinating my visit. Thank you, Lori. It won't be my last! This is my entry for Garden Bloggers' Bloom Day. 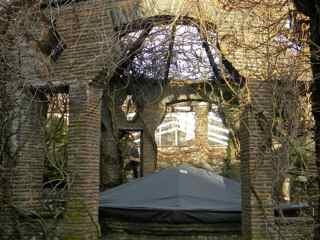 I hope Carol will forgive me, but I assure you Grey Towers is much more interesting than my garden right now! Next time I visit the mansion I will have pictures of real blooms, I promise! I am hoping to do another posting before Christmas, but in case I don't get to it, I wish all my wonderful garden blogging friends Peace, Joy and Love this holiday season! I wrote at length about our new fish pond that was installed this summer. Before I left for my trip to England, H.H. and I began preparing the pond for winter. I need to document the procedure so I remember what to do next year. A good rule of thumb is to complete this job between Halloween and Thanksgiving, depending upon the temperature of the water. 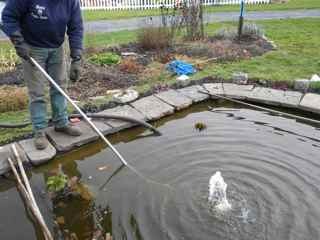 The water temperature in our pond had dropped below 50 degrees and the fish had a diminished interest in food, so we stopped feeding them and began the winterizing process. 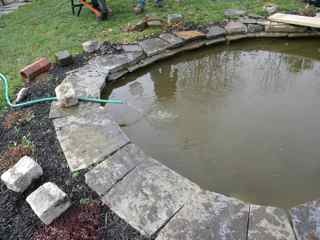 The goal was to have a clean pond before the more extreme winter weather began. I cut back the plants, discarding the floaters -- they are like the annuals in your garden. I do not yet have any tropical plants, but this would have been the time to remove them and store them indoors with a dish of water and strong light. I cut back the hardy water plants to two inches from the top of the pots. We removed some of the accumulation of debris from the water that occurred over the summer and placed a polycover over the pond to catch the falling leaves. On my return from England, I found that H.H. had continued the winterizing process. 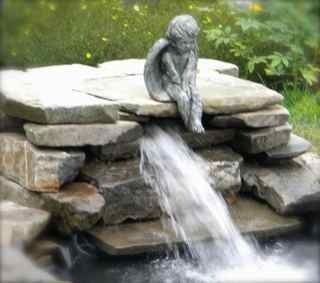 He had switched off the waterfall and replaced it with a small 'bubbler' . The waterfall was switched off so it doesn't freeze. If the waterfall is left running it will stir the water up too much. This is not good for the fish ... they need still water in winter so as not to burn body fat. H.H. removed and checked the water pump. He stored it in a bucket of water and placed it in the basement where it will not freeze. The filter was drained and flushed out, and the filter pads stored in a plastic bag. If you have a ultra-violet sterilizer, it also should be removed from the pond and stored, after cleaning, of course. 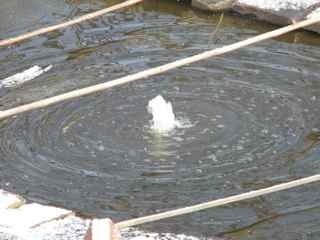 The 'bubbler' is a small pump placed in a bucket on the bottom of the pond. As this was all new to us, we were not sure what to do next, or if what we had done was correct. So I called in an expert to complete the winterizing process. 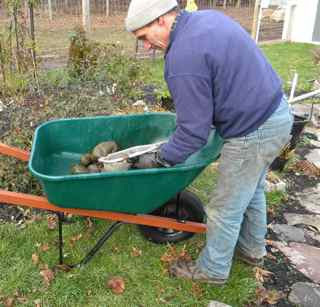 Steve Albanese from Albanese Garden Center has been installing and servicing ponds and water features for many years. He arrived yesterday and the first thing he did was to pump some water from the bottom of the pond to remove minerals that had accumulated there. He used a net to remove organic matter. Then Steve replaced the water he had removed with fresh water. If winterizing was done earlier, one-third of the pond water would have been removed. Fresh water was splashed in from the top. As you can see from the picture of the fish at the top, we installed river rock in the bottom of the pond, because we liked the way it looked. That was an obvious mistake as it was impossible to clean the bottom adequately and will be even more difficult as the fish get bigger. So Steve removed the river rock in order to complete the cleaning process. 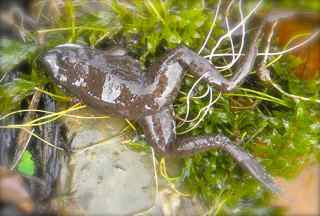 With the river rock, a 'sleeping' frog was brought to the surface. He looked like a shiny, rubber, toy frog. Frogs can freeze almost solid and still survive. 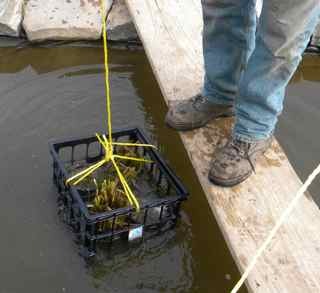 Steve took out all the remaining plants, placed them in a crate, and dropped them to at least 18 inches below the level of the pond water. First, he placed the dormant frog in one of the plant pots. 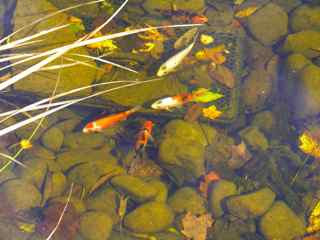 The fish need oxygen in the winter, but as I said, they require still water so as not to burn body fat. 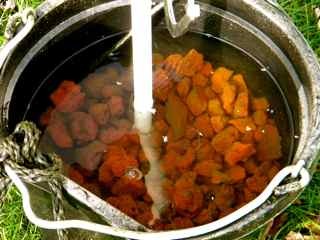 Therefore a small pump, with a short stem attached to it, is best placed in a bucket on the bottom of the pond. The top of the stem should be just under the surface of the water. Hopefully, this will stop an area of the pond from freezing while oxygenating the water. If the pond should freeze, Steve told us to lower a kettle of boiling water on the ice to melt a hole through it. He inspected the pump that H.H. had installed. He cut the stem a little shorter and placed the pump back in the pond to 'bubble'. Steve placed some old clay pipes in the bottom of the pond for the fish to hide in. 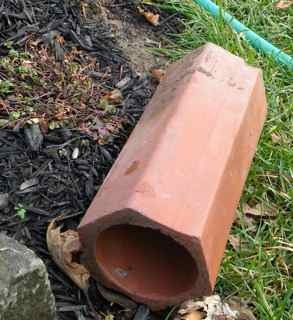 Actually, they are sewer pipes that were used at this house many, many years ago by H.H. 's father. In the spring I plant annuals in these pots. Steve put the net back over the pond to prevent more debris from entering, and to protect the fish from herons and other predators. Planks of wood (we use bamboo poles) placed across the pond, under the net, prevent it from sagging into the water. It is important that the net is raised above the 'bubbler' and Steve used cinder blocks to raise the net up at this point. 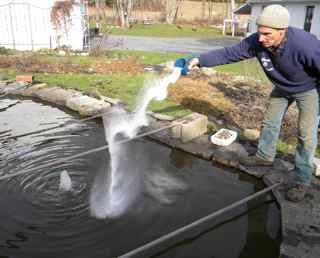 To complete the winterizing procedure, Steve added some salt to the water to promote healthy fish. Three cups of salt per one thousand gallons is the amount to use. He also added bacteria and a treatment for heavy metals as we have well water. 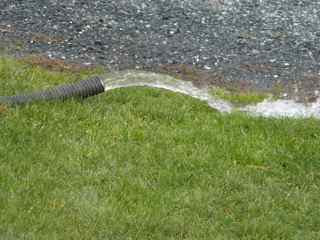 Add a treatment for chlorine if you have city water. This morning I looked at the pond through the den window. I saw it was snowing. Obviously, Steve had come to our rescue just in time. There was a layer of ice on the top half of the pond. We learned so much from Steve and we are grateful to him for sharing his expertise. 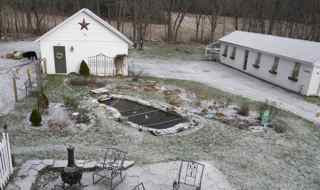 Now I can relax by the fire dreaming of spring and the pleasure my lovely fishpond will give once more.